Fred related the following information to Justine Chambers, who recently arrived in Mae Sot to work with the International Organisation for Migration’s (IOM) resettlement program. Justine’s Bachelor Degree in International and Global Studies (with Honours) in Anthropology, from the University of Sydney, Australia has inspired a strong passion for and dedication to community and international humanitarian affairs, with a particular interest in ethnic minorities and refugees in Southeast Asia. She has plans to pursue a PhD in Anthropology, and hopes to do her field work in Mae Sot. Justine has been enormously impressed by the work Fred has been doing through Eyes to Burma. And when Fred asked her to help with some of the daily tasks, she quickly accepted the invitation. Justine will also be helping with reports and updates – welcome, Justine! On another warm and sunny day in Mae Sot, I was visiting a friend’s guesthouse. Upon my exit I found a couple of foreign women untying bags of medical equipment. 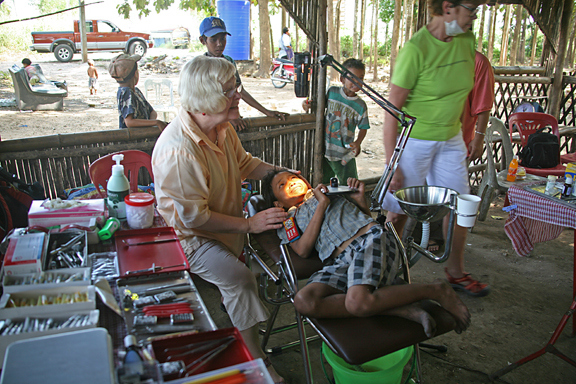 After approaching them, I discovered that they were in Mae Sot conducting a dental outreach program for a few of the Burmese migrant and refugee schools in the area. As you can imagine, without any hesitation I asked them if they would be so kind as to come down to the community in the dump and run a dental clinic for the day. Despite their time constraints they agreed without any hesitation to come the next day. With the little notice I had, I organized a clinic in a small facility I knew of that had electricity, and made my way around the dump spreading the word. 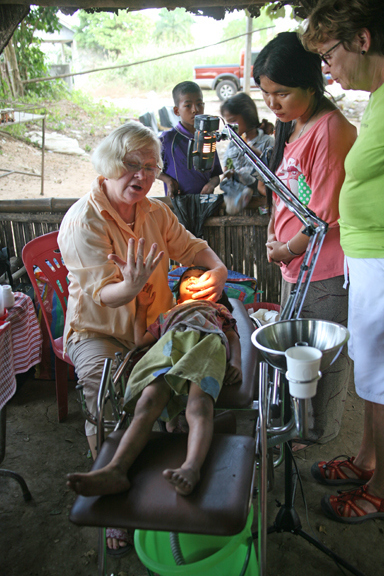 Most of the people within the community have never had any dental health care. As a result, one of the most prevalent personal health problems faced by these people are oral and dental health conditions. This is made even worse by the widespread habit among the Burmese of chewing betel nuts. When we arrived at the makeshift clinic the following day it took a few hours before anyone arrived after setting up. 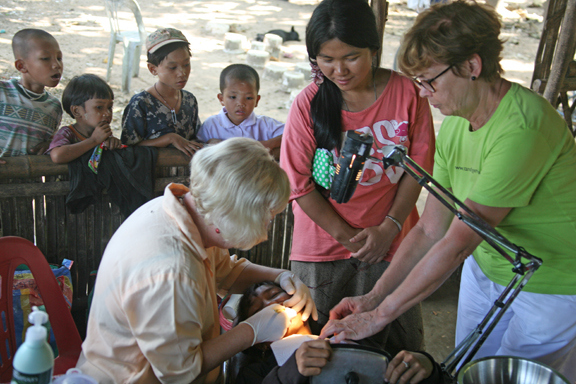 Burmese people are particularly suspicious of Western medical dental treatment and prefer traditional approaches to healing. Being the curious people they are, though, a few of the braver adults started trickling in, and by the end of the day we had managed to work on approximately thirty kids and twenty adults. This primarily included check-ups and fillings, and the removal of some teeth in particularly bad cases. I was absolutely amazed at how much had been done in such a short period of time and extremely grateful for the women’s gift of their time and resources. It’s always refreshing to meet people going out of their way to help others with such little recognition and bravado. All in all, this was a hugely successful day. It is particularly important in terms of slowly starting to educate the community about oral health and hygiene. A lot of the children here still have amazing teeth, so anything we can do to preserve that is always highly beneficial. Unfortunately, we have lost the contact details for these two wonderful women; if they read this post, I hope they get in touch as I’d love to hear from them. If any other skilled professionals are interested in coming to the dump for a day or two to do something similar, I would also love to hear from you as well.